Today, Boulderclough is a quiet rural hamlet with no facilities other than being at the terminus of a bus route. It wasn’t always so; at one time it had a chapel, a shop and a pub and if the residents worked at Swamp Mill down the hill they could walk there in five minutes. 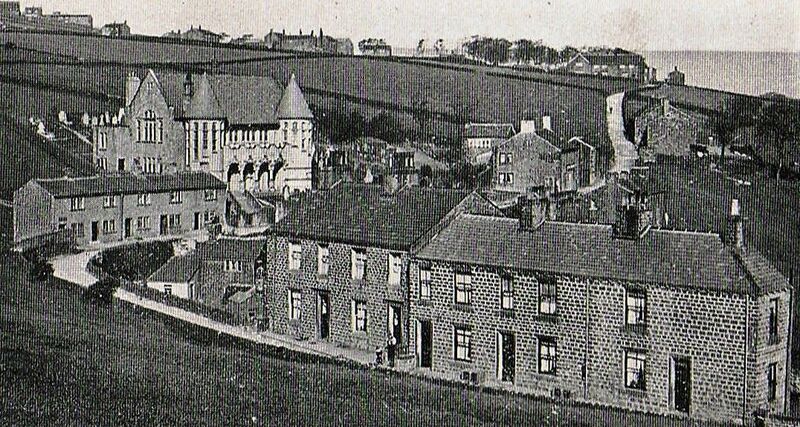 The chapel shown in the photograph (c.1923) is the second to be built on the same site, and still exists although now converted into residential accommodation. The original chapel that it replaced was built by the Primitive Methodists in 1823 and later, after being transferred to The Methodist New Connexion, it was known locally as the ‘Ranters Chapel’. The first chapel was very plain, hardly distinguishable from a private house, and in 1855 the members decided a new building was needed. It took 14 years to raise the £3,000 required, but finally the opening of the new chapel was celebrated on 1 October 1898. The cornerstones had been brought from the Holy Land by one of the members, Mr. Wilkinson Pickles. The new chapel also acquired a nickname being known locally as ‘Clough Oile Chapel’. It was built in the French Renaissance style with two towers flanking a portico of four arches and inside the pews were set out in a semi-circular arrangement. The chapel finally closed on 30 September 1979 after the congregation had dropped to an average of only twelve worshippers. The row of five cottages to the left of the chapel has long since been demolished. The one on the left-hand end of the row was a shop run by Mr & Mrs Greenwood who lived in the cottage next door. They sold provisions, sweets, paraffin and firewood. One of the other cottages was occupied by the caretaker of the chapel. Opposite the cottages there was a cobblers and a small working men’s club. The building with the two white chimneys to the right of the chapel is the former Kings Arms pub, the earliest known landlord being James Cockcroft in 1822. It was once a Ramsdens pub. On the 31 August 1970, it was the scene of a horrific incident when the landlord, Thomas Garside, committed suicide with a shotgun in front of several customers in the bar. The pub closed in 1989.